Save 40% OFF Seiko Men's Watches!! Infiniteshopping Offers - Seiko Men's Watches at 40% OFF. Click here to check largest range of Seiko Watches at Infiniteshopping.com. Save 40% OFF on Seiko Women's Watches! Save 40% OFF - Seiko Womens Watches at Infiniteshopping.com. Get Free Shipping All Over US. Buy Now. Get 55% OFF on Bulova Men's Watches! Infiniteshopping Offers - Take 55% Discount on Bulova Watches. Offer available for limited period. Buy Now. Sale! Save Up to 90% OFF on 100% Authentic Invicta Men's Watches. Sale! Save Up to 90% OFF on 100% Authentic Invicta Men's Watches. Shop Now. No Code Needed. Seiko Womens Sportura Watches Sale - Save Upto 45% OFF!! Seiko Womens Sportura Watches Sale - Save Upto 45% OFF!! And more Womens Sportura Watch: Tachymeter, Luminous Hands, Hour Markers And Date Calendar Display At Three O'Clock Position. Crystal Material: Sapphire. Case Material: Stainless Steel. Strap Material: Leather. 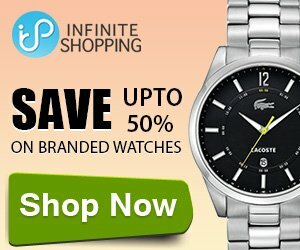 Infiniteshopping.com is a wholesaler of authentic branded watches. At Infiniteshopping.com, we provide you with a vast compilation of authentic branded watches with excellent customer services.